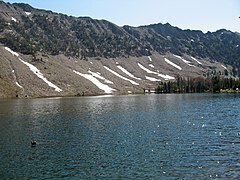 The Sawtooth National Recreation Area (SNRA) is a National Recreation Area located in central Idaho, United States that is managed as part of Sawtooth National Forest. The recreation area, established on August 22, 1972, is managed by the U.S. Forest Service, and includes the Sawtooth, Hemingway–Boulders, and Cecil D. Andrus–White Clouds wilderness areas. Activities within the 730,864-acre (2,957.70 km2) recreation area include hiking, backpacking, White water rafting, camping, rock climbing, kayaking, mountain biking, fishing, and hunting. The SNRA headquarters are about seven miles (11 km) north of Ketchum on Highway 75. SNRA also has a ranger station in Stanley, near its northern boundary. The SNRA was created on August 22, 1972 by Pub.L. 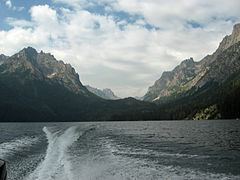 92–400, which including creating the Sawtooth Wilderness from the Sawtooth Primitive Area. The White Clouds and Hemingway–Boulders wilderness areas were created on August 7, 2015 by Public Law 114-46. Much of the SNRA was heavily glaciated, especially in the Sawtooth Mountains where remnants of these glaciers exist as glacial lakes, moraines, hanging valleys, cirques, and arêtes. 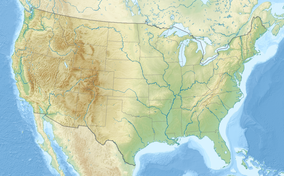 The Sawtooth Fault stretches 40 mi (64 km) long, and runs through the Sawtooth Valley, while the two past large earthquakes likely took place on the fault around 7,000 and 4,000 years b.p. The Sawtooth Mountains are located within the SNRA, along with the White Cloud, Boulder, and Smoky mountains. The highest point in the SNRA is Castle Peak at 11,815 ft (3,601 m) in the White Cloud Mountains, while the second-highest point is Ryan Peak at 11,714 ft (3,570 m) in the Boulder Mountains. Thompson Peak, at an elevation of 10,751 ft (3,277 m), is the highest point in the Sawtooth Mountains, while Saviers Peak at 10,441 feet (3,182 m) is the highest point in the Smoky Mountains. The headwaters of the Salmon River, also known as the "River of No Return" are in the SNRA, and the river flows north through the Sawtooth Valley before turning east in Stanley and following the northern border of the SNRA. The headwaters of the Big Wood, Boise, and Payette rivers are also in SNRA. There are hundreds of lakes in the SNRA, most of which have been created by alpine glaciers. The largest lakes are Redfish, Alturas, Pettit, Yellow Belly, Stanley, and Sawtooth lakes. Timber wolves were reintroduced in the 1990s and plans to reintroduce grizzly bears have been abandoned. The SNRA contains prime habitat for wolverines and the endangered Canadian lynx, but no recent sightings have been reported. Bull trout are the management indicator species for the SNRA and population monitoring efforts are undertaken every year. A 2003 memoir by John Rember, Traplines: Coming Home to the Sawtooth Valley, describes the life and culture of Stanley, Idaho before and after establishment of the Sawtooth National Recreation Area. Clint Eastwood's 1985 film Pale Rider was filmed in the SNRA, mostly in the Boulder Mountains in the fall of 1984. The opening credits scene was shot south of Stanley in front of the Sawtooth Mountains. The SNRA is one of the settings of the 2010 3-D computer-animated film Alpha and Omega. The Idaho Department of Motor Vehicles also created a license plate depicting the SNRA (see right). ^ Merrill, Troy; Mattson, David J.; Wright, R. Gerald; Quigley, Howard B. (February 1999). "Defining landscapes suitable for restoration of grizzly bears Ursus arctos in Idaho". Biological Conservation. Elsevier. 87 (2): 231–248. doi:10.1016/S0006-3207(98)00057-3. ISSN 0006-3207. Archived from the original (PDF) on February 12, 2013. This page was last edited on 13 February 2019, at 00:57 (UTC).